One of the world's leading conservation experts has warned that more funds are needed to conserve the Angkor temples in Cambodia. John Stubbs, of the World Monuments Fund (WMF), said one major temple, Phnom Bakheng, is at risk of collapse because of rapidly increasing visitor numbers. Experts from around the world are meeting in the Cambodian town of Siem Reap to discuss the preservation of the ancient structures. A frenzied atmosphere descends on Phnom Bakheng - one of the most popular sites at Angkor - as evening approaches. Everyday, as many as 3,000 people climb the temple to watch the sun set. But those numbers are taking a heavy toll on the ancient buildings. The temple and the hill it sits on are crumbling away. The WMF has been working to shore up the structure. John Stubbs, its vice-president, said tourists have seen Phnom Bakheng as little more than a viewing platform. Now he is hoping to educate visitors about the temple's significance. "People are climbing it not really knowing where they are. There's no interpretation of the site, no guided tours to explain the enormous importance of Phnom Bakheng. All of this is lost on the modern visitor who scrambles up at 4 o'clock to see that sunset, take that picture and scramble down," he said. Conservation experts are calling on tour companies to change their itineraries to reduce the pressure on key sites. 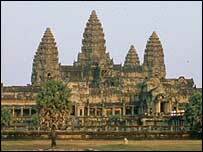 But the WMF says it may be necessary to close Phnom Bakheng to visitors while it is restored. The Angkor temple complex welcomed more than a million visitors last year, and numbers are set to increase as tourism becomes Cambodia's leading industry. Conservation efforts will have to be balanced with the economic need to exploit the country's heritage.